I wasn't even going to blog today but when I stumbled upon this news, I just had to give my two cents about it. 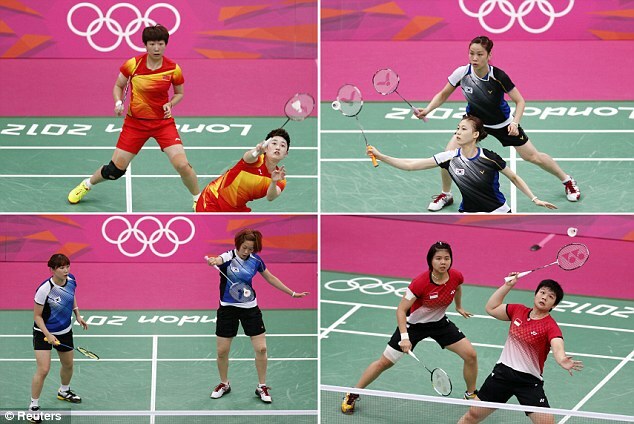 If you have been following the games in the London Olympics, particularly in badminton, you would have heard that 8 players in the ladies division was disqualified from the tournament on reasons of purposely throwing their game in favor of a better knockout stage position. The story was simple, team China was to book their place at the top of their group should they win their game against South Korea, which they were favorites to win. However by finishing top of their group, they were set to meet their fellow country compatriots in the next round and if they were to finish second, they were not only scheduled to meet a much weaker team but also avoiding their compatriots all the way to the final. So in a much unsporting behavior, they purposely played bad to the point of throwing their serves on purpose and smashing their shots right to the net. What made worse is upon realizing what they were doing, their opponents which were the South Koreans decided to do the same thing too. Making things even worse on the other side of the court, the Indonesians and another South Korea pair decided to retaliate and did the same thing in order to avoid meeting the Chinese favorites. In this situation, the crowd reacted very badly after realizing what was happening and probed the officials to take charge of the match and reviewed the match entirely. Now as a sports fan, particularly one who grew up with Badminton, I would obviously take my own research in judging the match itself to see if this is true. I found the full replay video of the match so guys, judge this video yourself. If you would look at the video from minute 10 onwards, you would see that the players started to throw their shots around carelessly and started to look very suspicious. Min 14:30 was when the umpires started to suspect something and told off both teams to take this game seriously. Once in the game by minute 15 all the way to the end was a showcase of unnecessary mistakes and the crowd responded promptly. Personally I feel that no doubt in my mind that this has been an absolute disgrace to a team that would do anything to win the tournament, even if it takes them to lower down their credibility as sport professionals to act this way at a competition of this level. It should be a lesson to teams like China and the rest of them that was rightly disqualified to remember that there are ethics within a sport and antics like this should not be tolerated. Reading on there were allegations that this was a norm that was done by the Chinese team in other competitions as well and when interviewed, the Chinese coach about this incident., he merely laughed and said "it was just a game, just like any other" and simply walked off. Well sir, you just kissed your gold medal goodbye. Serve you right you unethical cheats. hmmmm. *shakehead* despite of their skills, they still lack of sportsmanship! and yet these morons have the cheek to say its not their fault... haih. I think those players is really stupid >.< They shouldn't be like this.